You may remember my sister Cindy from Caring for Mother at Home: 6 Tips to Prevent Skin Breakdown, but if you don’t, allow me to give you a brief summary: My sister owned a very successful material-handling company for many years, but she gave it up to care for our parents in their later years. The timing was right for my sister and our parents certainly needed her. Along the way, Cindy gained much insight into caring for loved ones. I would like to share a small but crucial piece of the insight Cindy realized while caring for our mother — the importance of focusing on the emotional needs of the aging parent/patient, and not allowing the need for “physical care” to become your entire relationship. After you read Cindy’s comments below, I recommend that you seek help if you find yourself consumed with the “physical caring” only and missing the opportunity to fully enjoy the emotional and relationship needs of your loved one. While caring for my very ill Mother in the last years of her life, she was bed bound and totally dependent. Due to difficulties in coming off the ventilator while in the hospital, she had been sent home with a tracheotomy that she continued to live with. She had a feeding tube for nutritional support and of course, she had a urinary catheter. 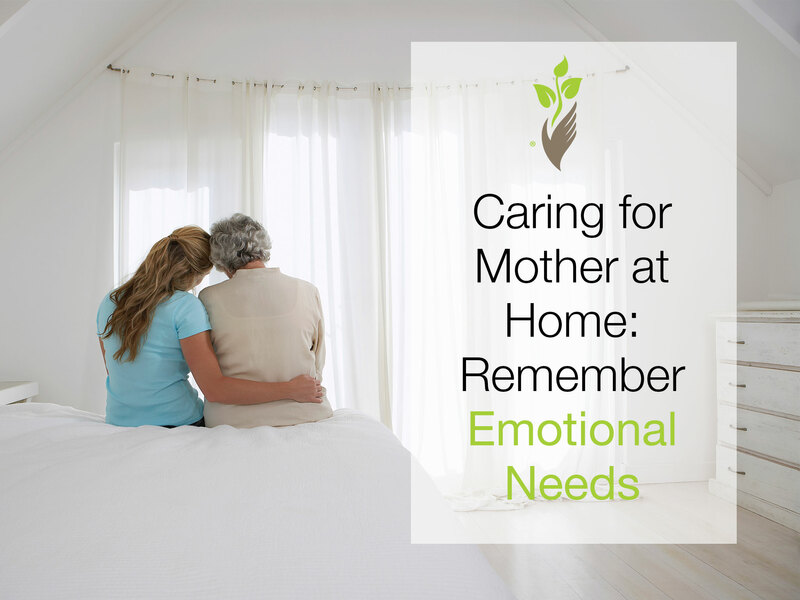 The extensive amount of care that had to be delivered to Mom every day was overwhelming at times. It was important to keep the tracheotomy site, catheter site, and the feeding tube site very clean to prevent infection. Along with bathing and changing her continuously, it was a very busy 24 hours for me. Make sure their room is bright with plenty of keepsakes around. Try to reminisce with them about the importance of a particular keepsake and let them tell you stories of its significance. If possible, have their bed near a window so they can look out. My mother enjoyed the squirrels and birds we fed outside her window. If no window is available, place pictures of their favorite scenes in their field of vision. Listen to their history. My mother especially liked me to listen to her talk about her service in WWII as a Morse code operator and watching VHS movies with her about the war. Take time for beauty! I learned to spend extra hours brushing my mother’s hair, applying the lotions she loved, and filing her nails. Stop and spend time together. Sometimes my mother just wanted me to sit with her and hold her hand. She loved me reading to her until she fell asleep. Toward the end of Mother’s time she said to me, “Please hug me, no one has hugged me lately.” It broke my heart to think I had missed this very special part of her care. With all the ongoing daily work to make sure her physical care was completed, I had forgotten one of the most important aspects of caregiving – loving and spending mother-daughter time with my Mother. If you find yourself in a situation such as this, where you are administering so much physical care that there doesn’t seem to be hours or energy left to stop and spend time with your loved one, please seek help. Being a caregiver can be challenging. There are caregiver services such as Preferred Care at Home that can allow you that time you and your loved one truly need so you can be a daughter again. For more information about Preferred Care at Home’s services, contact a location near you.